Jeffrey Ridley really has seen the highs and lows of LSBU, or rather, he quotes, “South Bank Polytechnic/South Bank University/London South Bank University”, which notes the evolution and change that the University has gone through since he first became involved with it. At 87 years of age, Jeffrey still maintains an active interest in auditing and corporate governance, and continues to publish articles and reviews. His 70-year career spans local government, the Colonial Service in Africa and two major global manufacturing companies, which then led him to his long-standing academic career at LSBU and beyond. His third researched book has recently been published by Routledge, and is titled ‘Creative and Innovative Auditing’, which explores how auditing practices will need to address the needs of today, but also tomorrow, demonstrating his continued active interest in the practical aspect of the subject area. He recently attended a conference of internal auditors across Europe at the European Commission by invitation as a VIP, where he found that the theme of his book was, by coincidence, virtually the same theme of the conference. The then South Bank Polytechnic was the first college in the UK to offer a Diploma in Internal Auditing to practicing internal auditors, which was not linked to a degree programme, a forerunner of today’s apprenticeship programmes. At the time, Jeffrey was Head of Internal Audit at Kodak Limited and a past president of the UK Chapter of (what is now) the Chartered Institute of Internal Auditors – where he was elected its first president in 1975. Jeffrey notes a proud moment after being involved as a voluntary lecturer at LSBU by being appointed as a Visiting Professor, by Baroness Perry, the then Vice-Chancellor, which he fondly recalls and comments: “The achievement of this academic appointment at the end of my career as an auditor recognised for me the value, then and now, being placed on practical experience in the teaching and research environment of the University”. He has remained a Visiting Professor at LSBU since that time. "My early years in teaching at the University led me into the importance of understanding the concepts and theories underpinning almost all I had practiced over the previous years, concepts and theories that had evolved and are still evolving through principles of good governance, quality and behaviour in organisations across all sectors. "The importance of this has not changed today nor will it tomorrow. Teaching, learning and practice need an understanding of these just as much today and always will. Evidence of this can be seen in national and global statements on intent in governance, quality and behaviour covering human rights, sustainability and the many best practices in organisations of all sizes across all sectors." Changes in teaching have been revolutionised by technology and distance is now no obstacle to learning, which will impact the transfer of knowledge forever. 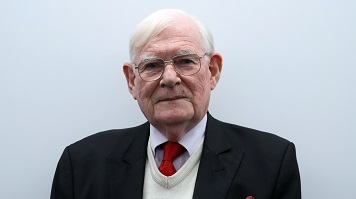 Jeffrey's Fellowship at The Institute of Chartered Secretaries and Administrators (who recently recognised his 50 year membership) added significant value to his period of teaching on the School’s postgraduate (MSc) programme in Corporate Governance. The course was developed in collaboration with the Institute and has for many years added and to our national and international reputation of learning in the field. In the 1990s Jeffrey took an active approach to research funding, and notes his critical involvement in three projects. The first was into the use of International Quality Standards by Internal Audit departments across the globe, funded by The Institute of Internal Auditors Research Foundation in the USA. The second project, which looked into internal auditing in the UK, funded by the Institute of Chartered Accountants England and Wales Audit Faculty, was carried out jointly with LSBU Emeritus Professor Dr Kenneth D’Silva. The third relates to a paper presented at an Academy in Business Society Conference in Russia on Sustainability Assurance issues - again carried out jointly with Professor D’Silva. All three projects resulted in findings which have impacted and still impact governance, quality and behaviours in auditing today.